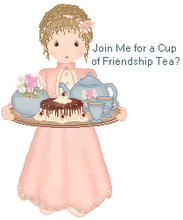 Friendship Tea: How Many Cups of Tea in 2010? How Many Cups of Tea in 2010? Sarah, Brit Gal in the USA, held a contest to see who could guess the closest number of mugs of tea she would drink in 2009. My guess did not win because it was too high. Sarah is having the contest again in 2010. I lowered my estimate of her tea consumption for this one. I actually considered counting my tea consumption. I started my 2010 tea drinking yesterday and after several servings Harney's Queen Catherine Blend in my favorite bone china mug while multitasking around the house, I already lost count! One thing is for certain... I bet I will drink more tea in 2010 than Sarah did in 2009, and that doesn't include our beloved southern iced tea. To all my blogging friends — Happy New Year and enjoy your tea! LOL and here I was already to guesstimate your yearly capacity for tea, which I knew would be much higher than mine. I swear your a Brit in disguise Linda! Lovely calendar! I'll be drinking my share too this year as always. :) Happy New Year Linda! I had thought of doing that as well (counting the number of cups of tea I drink in a year), but I just know I couldn't keep it up! What a fun idea to count them. I wonder how many cups I actually drink in a year.